Only the best in filtration media, Canadian Spa Company Glacier Filters keep your spa water and tub equipment pristine. These filters are infused with Microban<sup></sup> antimicrobial protection to inhibit the growth of bacteria upon the cartridge and extend the filter's life span. An additional silver-ion is imbued in the fabric and plastic of the filter, which acts as a natural disinfectant against micro-organisms and harmful bacteria. Spend less time cleaning your filters and more time enjoying your spa! The Glacier Microban<sup></sup> 100 Sq Ft Filter Set comes with two 50 Sq Ft Glacier Microban<sup></sup> filters as well as two Glacier Pre-Filter Screens. This filter set works exclusively with the following Canadian Spa Company spas (models purchased after 2014): Toronto Spa, Winnipeg Spa, Victoria Spa, Vancouver Spa, Thunder Bay Spa, Quebec Spa, Ottawa Spa, and Niagara Spa. Filter should be changed every 4-6 months (depending on usage). 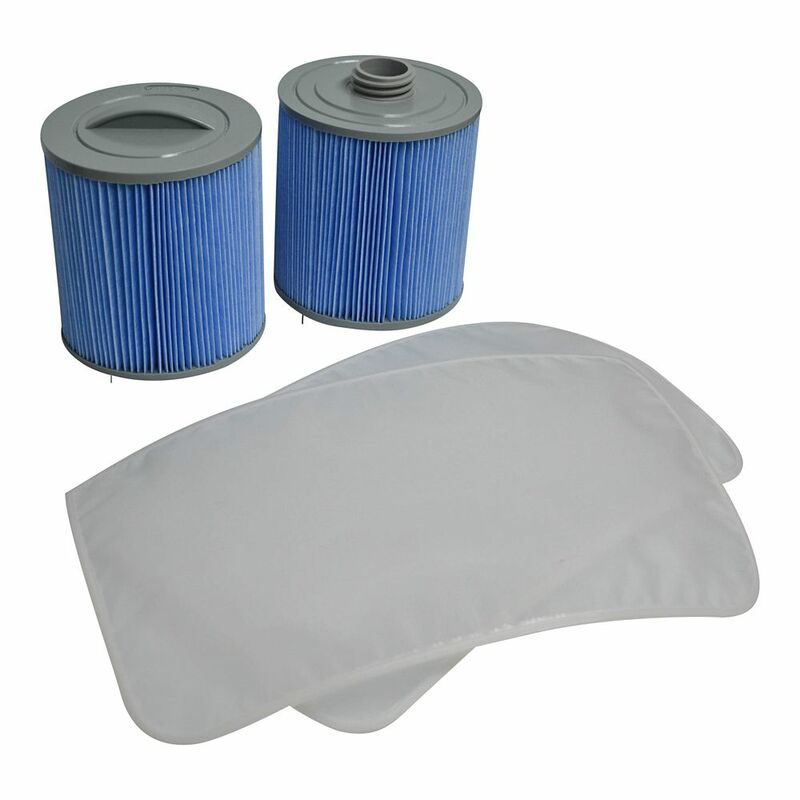 Set of two 50 sq ft Glacier Microban filters and 2 Glacier pre-filter screens. 219 pleats of high quality Reemay<sup></sup> help to ensure that your spa gets the filtration that it needs. Filter should be changed every 4-6 months (depending on usage). For best results. clean your filters regularly using Canadian Spa Filter Free Cleaner Solution. NOTE: This filter replaces the following filter models: Unicel C-4335, Pleatco PRB35-IN, Filbur FC-2385. Keep your hot tubs cleaner for longer with Canadian Spa Company filters! This 50 sq ft open filter has 212 pleats of genuine Reemay material. This filter can be used in place of the following models: Unicel C-4950, Filbur FC-2390, Pleatco PRB50-/-MIN, Aladdin 15002. NOTE: Filters should be changed every 4-6 months (depending on usage). For best results, clean your filters regularly using Canadian Spa Filter Free Cleaner Solution. Glacier Microban 100 sq. ft. Filter Set Only the best in filtration media, Canadian Spa Company Glacier Filters keep your spa water and tub equipment pristine. These filters are infused with Microban<sup></sup> antimicrobial protection to inhibit the growth of bacteria upon the cartridge and extend the filter's life span. An additional silver-ion is imbued in the fabric and plastic of the filter, which acts as a natural disinfectant against micro-organisms and harmful bacteria. Spend less time cleaning your filters and more time enjoying your spa! The Glacier Microban<sup></sup> 100 Sq Ft Filter Set comes with two 50 Sq Ft Glacier Microban<sup></sup> filters as well as two Glacier Pre-Filter Screens. This filter set works exclusively with the following Canadian Spa Company spas (models purchased after 2014): Toronto Spa, Winnipeg Spa, Victoria Spa, Vancouver Spa, Thunder Bay Spa, Quebec Spa, Ottawa Spa, and Niagara Spa. Glacier Microban 100 sq. ft. Filter Set is rated 3.0 out of 5 by 2. Rated 5 out of 5 by adventure from Fast delivery These filters are exactly what we were looking for; and delivery was fast. Are these filters for the Winnipeg Spa from Canadian Spa company? The Glacier filter set fits all of our hot tubs that have a black box grate-style filtration system. If you have any further inquiries, please feel free to call us at 1 877 347 7727.